News from the RMU mechanical team can actually be condensed in this article title, CAD – Computer aided designed – of the ejection system is still far from the expected CDR result… However, the RMU team (well okay that used to be only me…) captured an additional member: Antoine, a French student doing his master thesis at KTH. Back to business: Last week focus was on the deflection of the aluminium beams supporting the FFU. The maximum weight of one FFU is 2kg. The FFU is in contact with three beams, including two below. It is especially these two last beams that interested us since they are submitted to a 30g x 2 kg = 588.6 N force in the vertical direction due to launch loads. The aim of this analysis was to determine the minimum allowable deflection hence thickness of these supporting beams. 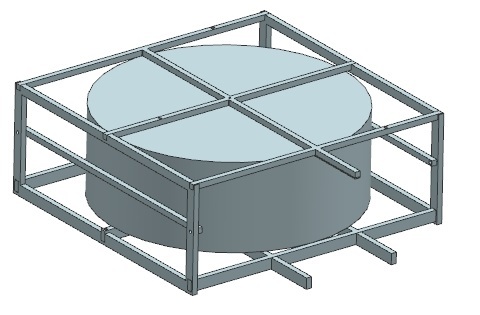 Answer is: the two lower beams should be at least 15mm height…Knowing this, we can now design the final version of the vertical support which will maintain the FFU before the ejection. Don’t panic, this is only a focus on the support maintaining the FFU in the vertical direction with three beams, the current state of the ejection system is more elaborated! Hope to post more pictures soon! Back to CAD!